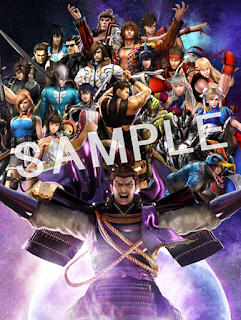 The official Sengoku Basara 4 Sumeragi website updated overnight as usual. We now have the official story summaries for the three new characters. As a member of the samurai class, Takeda Shingen decides that it is his duty to investigate Ashikaga Yoshiteru's behaviour. But then again, he repeatedly asks himself whether he will even be capable of recognising the scale of Yoshiteru's 'vessel'. After evaluating the shogun's power, Shingen sets about trying to determine what Uesugi Kenshin is thinking to be working beneath him willingly. Shingen takes his army and heads towards the battlefield where the warriors of the Ashikaga faction are assembling. Passing the seat of the clan head to Maeda Keiji, Toshiie supports him and battles to protect the Maeda family along with his wife, Matsu. However, there are times when he's also troubled by the movements of his former master, Oda Nobunaga. To bid farewell to the past where he fled from working under his former master Oda Nobunaga - feared as the 'Demon King' - and save those who were left behind, Maeda Toshiie decides to subjugate Nobunaga. Together with her husband Toshiie, Matsu supports Maeda Keiji, who has become the head of the reborn Maeda Army. Keiji introduces her to the shogun Ashikaga Yoshiteru and their resulting interactions bring about the 'Turbulent Times of Food'. After receiving a secret message from Oichi, the Maeda family hurry to Sengenji in Kyougoku-Azai Army territory. As they speak to Kyougoku Maria at their destination, the situation develops in an unexpected direction. I've corrected the name of Matsu's first R1 special in the previous post, as they confirmed the Japanese reading and my assumption was completely wrong. The meaning is unchanged. Matsu's Giga Basara artwork shows all of her animals; hawk, boar, mole, wolf and bear. Her two-character phrase is 馳走 ('feast'). It's hard to tell but it's been officially confirmed via magazine article that Toshiie's Giga Basara art is supposed to be a wolf. His two-character phrase is 犬千 ('dog' and 'thousand', but obviously a direct reference to his childhood name of Inuchiyo). Takeda Shingen's Giga Basara illustration is a tiger (obviously) and his phrase is 虎翁 ('venerable tiger'). Toshiie has a drawing and text on his back too. They both look as though they've been on holiday and soaked up the sun. Speaking of the new pictures, all of the shots on the character pages are great. I love the teasers of Matsu's animal-filled new Basara attack. With this update we've had confirmation of four characters with two medal costumes: Masamune, Yukimura, Kojuurou and Naotora. Each of them has had one proper costume (or recolour) and one with a small aesthetic change, such as glasses, a helmet, a mask and a different hairstyle. Assuming that all forty characters have personal inscriptions, revised skills, costumes and limit-breaking inscriptions, this leaves just three slots unaccounted for in the list of rewards. Given that there's also a Medal category for audio rewards I'm not expecting many more extra costumes to be revealed for characters who have already been seen wearing a Tenka Medal costume. There's also a big new feature all about the 21 Costume Hobby Box special edition of the game. It explains that the bundled costume DLC codes will be valid until 11th January 2016, and shows off the box artwork. There are samples of the small art book (inside and out) on the same page. Finally, the first Bokesuke promotional video is now online too, but it's not all that great. Fans of Japanese comedy might enjoy it, I guess? Far from it. I believe it's always been "canon" that Nobunaga, Hideyoshi, Kenshin and Shingen are tied for the strongest characters in the Basara universe. It's just that they're all second place now (perhaps tied with Masamune and Ieyasu now too, due to the whole "DRAGON LORD" and "Bonds King" business), now that Yoshiteru came along and decided he was top dog. So now, Shingen's trying to determine if he even can take down Yoshiteru or not (and given it's his story, it's likely the answer is yes). Then in his drama route, he's trying to figure out why Kenshin would willingly bow to Yoshiteru. And from the screenshot it looks like he basically throws Yoshiteru's weapon away, so it's likely that Shingen manages to defeat Yoshiteru. I wouldn't worry about them making Oyakata-sama look "weak". It's worth noting, too, the summary indicates he's going to the Remains of Ounin stage from the start of his drama route- meaning it's very likely he defeats Motonari, Tsuruhime, Kenshin, and Yoshiteru in one go, then still has one or two stages after. Yh that makes me feel better lol :) , I guess I was looking too blindly at the vessel thing. Wait, Toshiie's is a wolf, really? Looked like a cute little shiba inu to me! I guess maybe some Japanese wolves (when wolves were extant in Japan) had small tails too or something? I have to admit I'm rather disappointed that it really does seem like a lot of the characters will only end up with tenka "accessories" rather than true extra costumes. I'd even take a color swap!! I guess I just have to hope the 5 "returning" characters will be able to get alts in a way similar to everyone else in the first game. Should clarify I meant SB4 not SB by "first game", ahahahaha. I wonder whether it was a mistake by the magazine? I can forgive the weak medal costumes if the actual new costumes are good. Now that I think about it, Masamune has been shown with a 'light armour' version too so that's another one of the potential medal costumes gone (unless it's a new non-medal alt...? ).